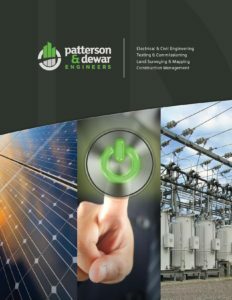 Patterson & Dewar Engineers, Inc. (P&D) is pleased to announce that we have released our new corporate brochure. As we approach our 70th anniversary, this new brochure provides an updated look at our company, our culture, and the services we provide. Established in 1947, P&D provides engineering, construction management, and land surveying services from our offices in Atlanta, Nashville, Dallas and Amarillo. P&D specializes in designing and evaluating vital electrical infrastructures, and assists electric utilities, cooperatives, and municipalities across the United States with a wide range of solutions including substation design, transmission line design, construction work plans, long range system studies, smart grid solutions, SCADA design and systems integration, cost of service studies, rates design and more. Download a PDF of our new brochure, or contact us to request a printed copy.